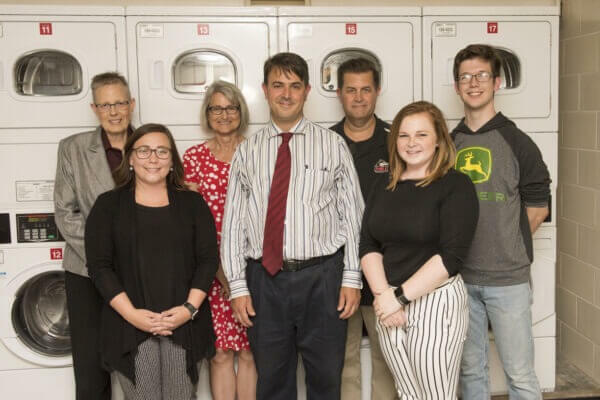 NIU students, faculty and staff recently worked together to ensure NIU students with visual disabilities would be able to independently do laundry in the residence hall laundry rooms. It was a campus-wide effort to be proud of, say all involved. To do laundry in the residence halls, students swipe their OneCards and then choose a washer from a touchscreen. When Debra Miller, director of the Disability Resource Center, learned students with visual disabilities couldn’t do this independently, she contacted Katy Whitelaw, NIU’s Information Technology Accessibility Officer. Under Illinois and federal law, the touchscreen on the OneCard reader–considered electronic and information technology–must be accessible to people with disabilities. “The law clearly states that people with disabilities must be able to use technology like this independently,” said Whitelaw, who brought together a team of people–all aiming to ensure students with visual disabilities would have the independence they deserve. The joint effort involved mechanical engineering students and faculty, as well as staff from Housing and Residential Services, the Division of Information Technology and the Disability Resource Center. Whitelaw contacted Ruperto Herrera, a program analyst in DoIT, who remembered a discussion about card readers on a mailing list a few years ago. He forwarded it to Whitelaw, who sent it to Tim Trottier, assistant director of Housing and Residential Services. “Tim put it all together,” said Whitelaw, who recently awarded Trottier with a “Huskies Superhero Award”–complete with a red cape and mask–for his efforts. Given to Whitelaw by Miller last year, the award is passed around to those who go above and beyond their typical job duties. University Ombudsperson Sarah Klaper created the award to provide kudos to university employees. 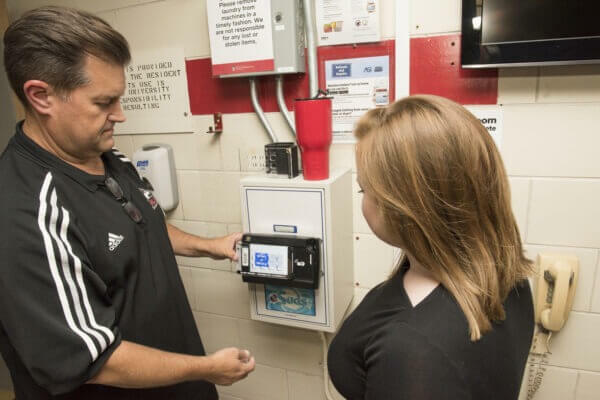 “[Trottier] figured out that we needed to create a custom overlay for the card readers and that mechanical engineering could probably do the job,” Whitelaw said. Professor Federico Sciammarella works with Thomas Corbett to make acrylic overlays for the laundry facilities in the residence halls. Thomas Corbett of Genoa, a senior majoring in mechanical engineering, and Todd Durham of Genoa, a sophomore majoring in mechanical engineering, worked on the project this past summer with the help of Federico Sciammarella, an associate professor of mechanical engineering and interim chair of the College of Engineering and Engineering Technology. They used a laser to cut clear acrylic to make an overlay and a 3D printer to create a clip to hold the overlay on the card reader. Bailey Thomas, a graduate assistant at the Disability Resource Center, made hundreds of braille stickers for each cutout on the overlays, as well as braille stickers for all of the washing machine control buttons. She put in hours of work on the project, outfitting nearly 300 washers and dryers throughout the university. Tim Trottier and Bailey Thomas place an acrylic overlay on a card reader in a residence hall laundry facility. She also created instructions in braille and helped orient students with visual disabilities to the system. Sighted students can use the touchscreens without removing the overlays. The project took on added meaning for all who took it on. Sciammarella had sought out engineering students willing to help, and Corbett and Durham eagerly volunteered. “As faculty, you’re always trying to find ways to engage students,” Sciammarella said. “Having real-world applications is a great way for students to use what they’re learning and create natural solutions. It seemed like a natural fit. Unlike other projects, which last longer or remain in concept stage, students were able to go from design to building to assembling a finished project in a couple of months, Sciammarella said. The Disability Resource Center at NIU is mandated to provide full and equitable access for students with disabilities. The most prevalent accommodations are often in the classroom or for testing. In the residence halls, Miller said, all students should have equitable access and the ability to do their laundry. This unique collaboration afforded that, and so much more, she said.